Love rocking out to videgames but feel not-so-rock-ish with a plastic guitar controller? Peavey and Art Guitar bring you the Riffmaster. The Peavey AG Riffmaster is a real-wood, life-size Peavey guitar, modified for play with guitar-based music videogames on PlayStation 2. Featuring the sleek finish, dimensions, and feel of a real Peavey guitar, the RiffMaster guitar controller is designed to provide players with a more "authentic music videogame experience." The Riffmaster's neck features five colored fret buttons placed among real frets on a genuine rosewood fretboard, with the familiar strum bar and whammy bar mounted to a basswood body. 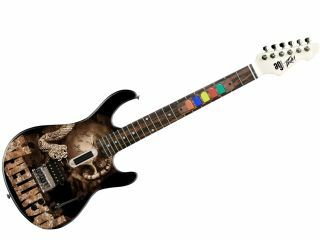 Players can choose from a bank of 20 custom designs, including exclusive artist designs from iconic rock artists such as KISS, Pantera, Lynyrd Skynyrd, Ozzy Osbourne and Megadeth (more bands are on the way), or upload their own JPG image to the Custom Graphics portal at the Peavey Custom Shop and design a one-of-a-kind RiffMaster. Controllers for PS3, XBox and Wii game systems should be ready sometime in the fall. US list price is $399.00.